Marine Mooring Anchors for securing silt barriers and oil containment boom, boats, floating docks, navigational aids, and marker light buoys. 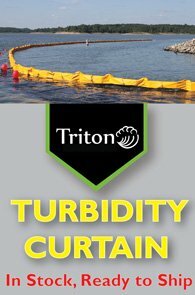 They are offered as complete kits fully assembled ready for easy deployment or without assemblies (rode and buoys) or as single stand along anchors. These standard anchoring kits will make installing any floating marine barrier a breeze. The galvanized fluke-style securely sets into the river bottom and safely holds your equipment in place even in the toughest of conditions. Visit USCG to read more about marine anchoring regulations. These may vary by state and is recommended you contact local sate authorities. See the full accessories page, and learn more about marine anchors with our Marine Accessories Product Flyer (PDF). Questions about marine mooring anchors? We can help with all of your barrier anchoring needs. Call the GEI Works team at 1-772-646-0597 or submit a form. 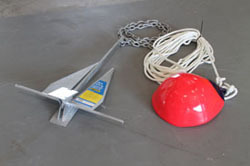 Fluke type galvanized steel anchor with safety wired galvanized shackle. 8' / 2.43 m x 3/8" (10 mm) galvanized steel chain lower rode. 60' / 18 m x 5/8" (16 mm) polypropylene rope upper rode with thimbles. 6' / 1.82 m x 5/8" / 16 mm polypropylene painter rope with thimble and Galv. shackle. NOTE: Longer lengths of upper rode (5/8" Poly Rope ) available at additional cost. Questions about anchoring floating barriers? Call the GEI Works team at 1-772-646-0597 or submit a form.